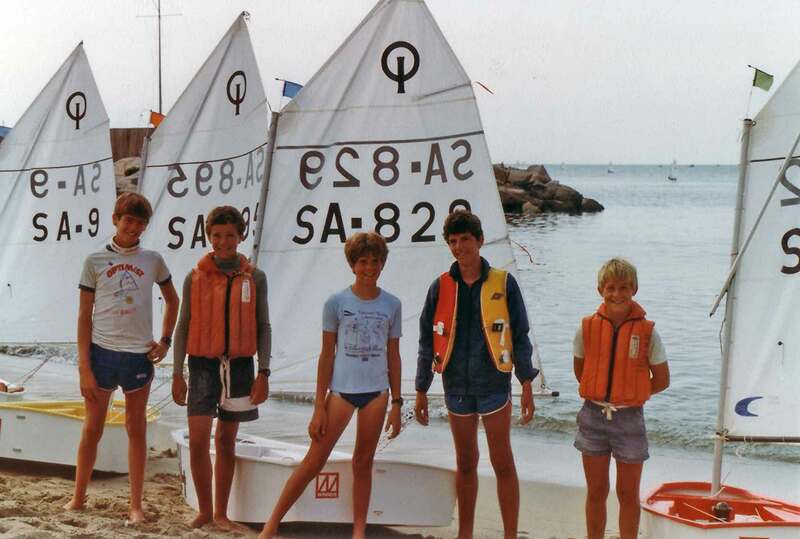 Optimist Sailing SA (previously OCRA) was started at Midmar in 1968. The Optimist Class was introduced here by Nigel Ringrose, who worked for the United Nations. He had earlier introduced Optimists to (then) Rhodesia and that is the reason that the associations in both countries are (still) called 'OCRA" (then (Rhodesia) and (South Africa), now of course (Zim). Nigel Ringrose later became president of IODA (before Peter Barclay, Rene Kluin, Helen-Mary Wilkes and AI Chandler). The very first worlds that SA was to send a team to was to be held in Zimbabwe - then Rhodesia - at Kariba in 1973. This event was cancelled for political reasons and so the first selected team went nowhere. Denmark 1975. 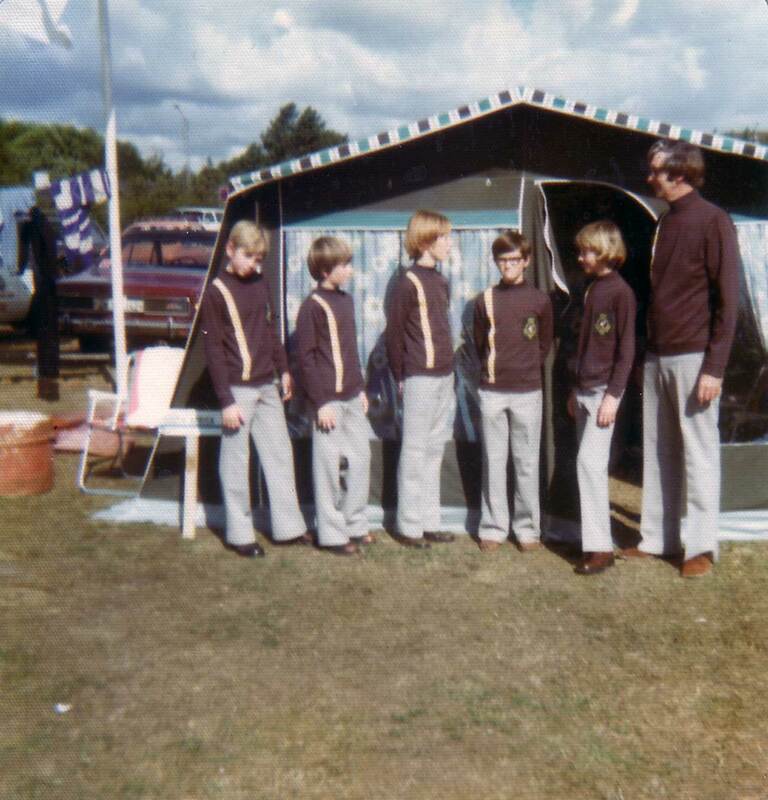 South African Team outside their tent. From left to right: Gary Holliday, Garth Barrett, Richard Wedderburn-Clarke, Graeme Robertson, Simon Bongers, Eric Bongers (Coach). 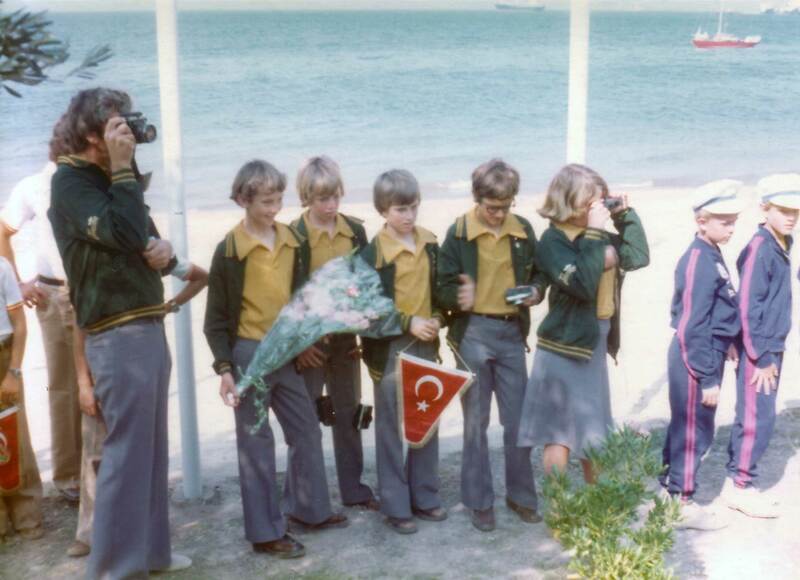 Turkey 1974. SA Team at the Opening Ceremony. From left to right: Eric Bongers (Coach), Simon Bongers, Gary Holliday, Garth Barrett, Graeme Robertson, Herda Silverman. After this, the 'sporting ban' became more and more of a problem. Although South Africa was never officially banned by the IYRU (now ISAF), we were effectively banned from the World Championship. 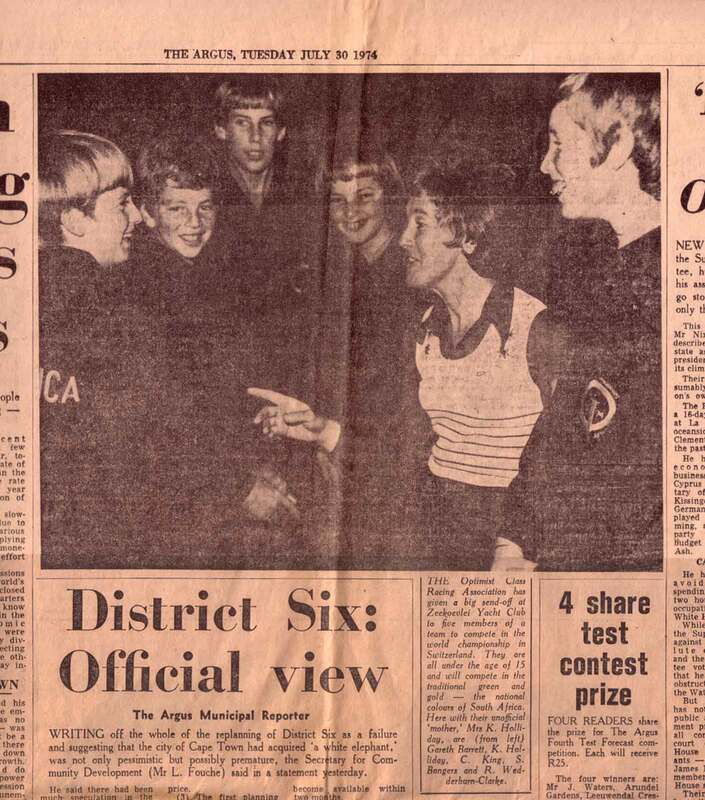 This was either because the host countries would not give us sporting Visas or because the host organisation would not take the risk of international incidents (as the one mentioned above in 1976) or other teams being withdrawn by their countries .. At the time, we tried to argue that this was a children's event and that it would be good for the South African children to see how a normal society functioned, but that was never successful. At the time, it was very frustrating, now the logic ('sacrificing' one team in order to protect many others) of course makes sense. In 1980 a team went to the Portugal worlds and sailed the full regatta. SA Team 1983. From left to right: Nico Van Wieringen, Stephen Loxton, Nicky Hooyberg, Greg Hall, Graham Bryant. I joined OCRA in 1983, and was appointed coach. 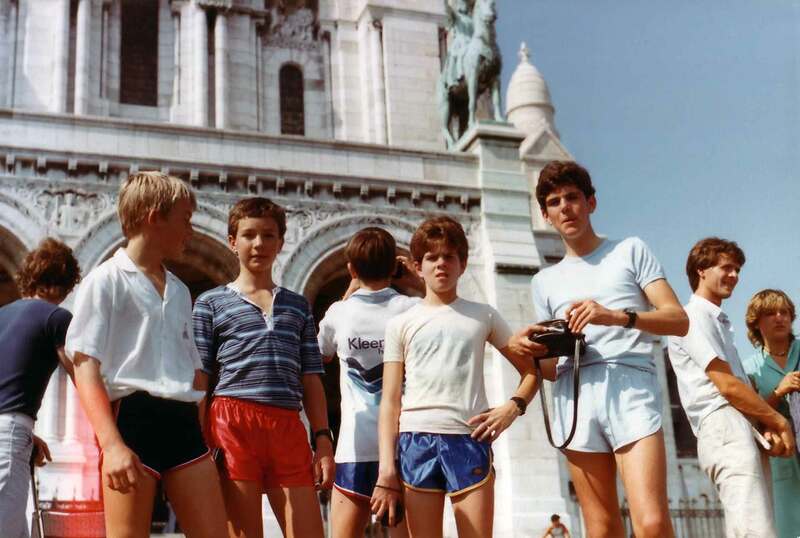 We did not get visa for Brazil where the Worlds were and I took the initiative to organise an 'alternative' tour for the team, (Nico van Wieringen, Stephen Loxton, Greg Hall, Graham Bryant, Nicky Hooyberg). OCRA was happy with this, but could not give financial support, so in the end the team members' parents paid, supported by their provincial Oppie associations (Transvaal for Nicky Hooyberg, Western Province for Nico van Wieringen, Stephen Loxton, Greg Hall and Graham Bryant). It was the year of the first European Championship and in the end (after hundreds of Rands of 'phone calls - a lot of money then and no email!) they agreed to let us sail, but not include us in the official results but in the results of the 'open fleet' which consisted of the 5 of us plus five extra Spaniards (the championship was in Barcelona). But we sailed with everyone else and they provided 'unofficial finish lists' so we could see how we did. Nico won a race and finished 'unofficial' fifth overall so we were quite chuffed. In pictures . . .
From left to right: Graham Bryant, Stephen Loxton, (Nico van Wieringen with his back to the camera), Nicky Hooyberg, Greg Hall. It was the first time we saw (and hired!) Winner boats, at home it was still all wood! Before that regatta, we went to an International event in Carentec (Brittany). First there was no problem, but there was a Frenchman (with an African wife) who objected to our presence. He contacted the French federation (FFV) with whom I compromised that we would cover up the 'SA' letters in our sails. Of course, you could still clearly see the 'SA' from the back! The Frenchmen next to us in the boat park were so embarrassed and upset that they covered the 'F" in their sail as well! Tours were very different then. It was just one coach / team leader and the team. No email, no fax. We drove in a rented Mercedes (I had ordered a big station wagon, but that was not available when we arrived at the airport in Paris) with the smallest two boys on the front seat and the other three in the back. All the sails (and spars, we had brought those but they did not fit the rented boats anyway!) were strapped on a roof rack. We drove from Paris to Carantec and then to Nice and from there we flew to Barcelona. On the way we stopped for the night a few times. Once we tried to 'phone home, you still had to book a call in those days and we could not get through so we sent postcards. One of the mothers later told me that she thought I had abducted the lot because there was no news. In pictures . . .
From left to right: John Leighton, Simon James, Hans Thijsse, Gary Farrow, Graham Bryant. Ian Statham in front. In 1984, a team (Graham Bryant, Gary Farrow, Simon James, lan Statham, John Leighton) went to the US nationals and the North Americans. I had hired a camper for us to stay in, that was quite fun. Read more . . .
From left to right: Christiaan Orton, Shaun Carkeek, Malcolm Hall, Andrew Ward, Ian Statham and Hans Thijsse at the back. In 1985 the team (Ian Statham, Shaun Carkeek, Clive Walker, Christiaan Orton, Malcolm Hall, Andrew Ward) went to the South Americans in Algorobbo, Chile. Chile had had an earthquake a week earlier, so a lot of he surroundings were in ruins, but fortunately the yacht club and the accommodation was OK. Read more . . .
International Optimist festival (Lake Garda, Italy). Donovan Tait, Christoff Aspeling, Nicholas Cloete , Brendan Lee, Robin Paterson, Dale Hudson ("U13"). South American Championsip (Ecuador). 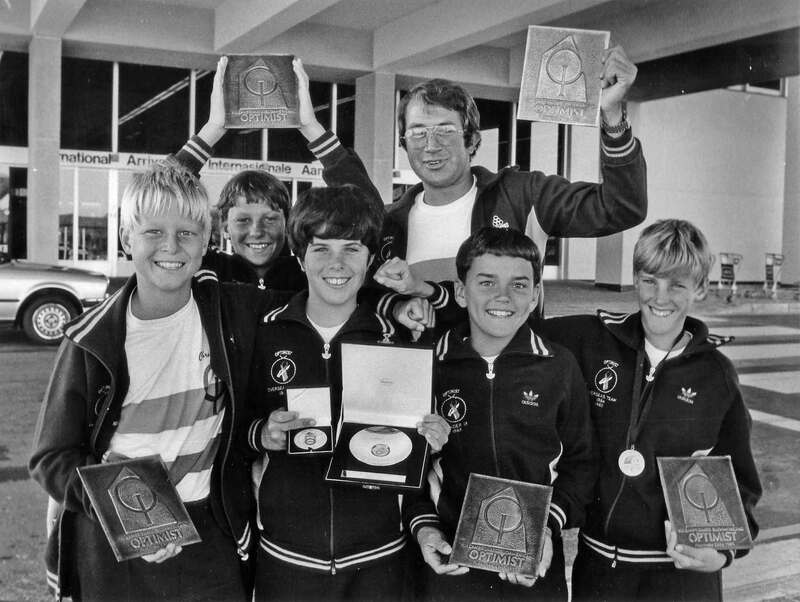 Greg Barker, Christoff Aspeling, Charles Nankin, Davy James, Matthew Mentz, Alon Finkelstein ( "U 13"). US Nationals. 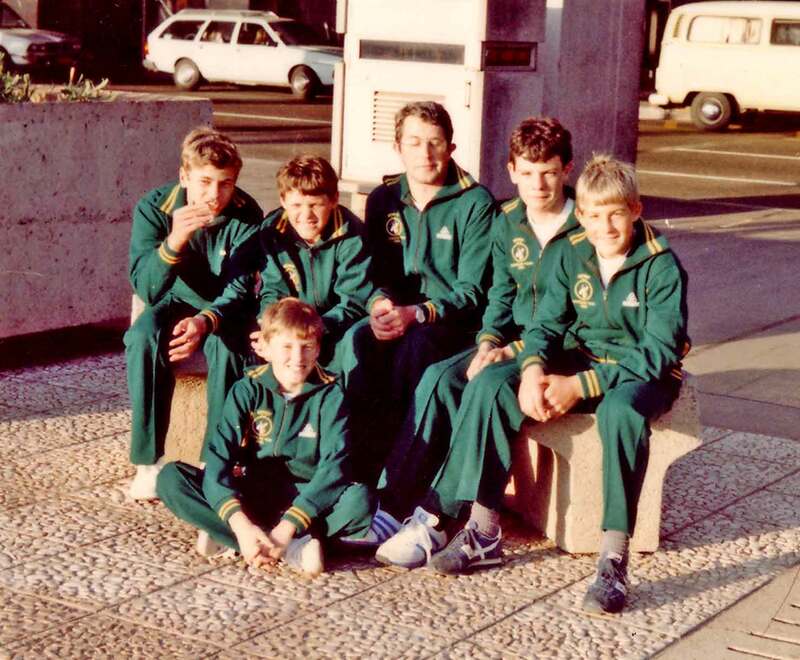 Greg Barker, Charles Nankin, Stephen Cloete, Roger Hudson, Grant Hagedorn-Hansen, Bruce Keen ("U13"). During 1991, the SA sporting ban was universally lifted. This was just too late to enter the Worlds that year, but we soon received an invitation to sail in the European Championship in Denmark in 1992. The Worlds was at Christmas time in Argentina. So we decided to do this as an 'extra' and also to see where we stood. We invited each region to send its best skipper. As Eastern Province and OFS (still a region then) declined, we took 2 from Tvl and WP. The team thus chosen consisted of Alon Finkelstein, Charles Nankin, Roger Hudson, David Hooper and Andre van Aurich. It was really interesting; the wind was light and switchy just like the Transvaal. Alon won not only a race, but the whole regatta, which was a huge shock and surprise to anyone! But it was fantastic! The others did not disgrace themselves either. Of course that made Alon one of the favourites to win the worlds as well, but that was another story with big waves etc on the sea! Number 2 at the Europeans (an Argentinean) won the Worlds, so the competition was not easy either. One of the Portuguese (Gustavo Lima) came to our Nationals Uust before the worlds, at Midmar), to practice against Alon. Gustavo won the Nationals, I think Sieraj and Alon were second and third (but I am not sure about that). Worlds - Menorca, Spain (with Malcolm Hall as coach). Sieraj Jacobs, Alex Runciman, Ryan Collins, Bruce Keen, David Hooper. Gallery . . . Team RSA Sardinia 1994. From left to right: Gareth Blanckenberg, Luc van der Walt, Malcolm Hall (coach), Sieraj Jacobs, Ryan Collins, Warren Harvey. In Menorca, in 1993, we had indicated that South Africa might be interested to organise the 1996 Worlds and in 1994 we won the right to hold it (against Hungary). The venue was Club Mykonos in Langebaan and Nesquick the sponsor (Nesquick international was also the International Optimist sponsor at that time). Mykonos and Nesquick were fantastic partners to work with. The only problem was the charterboat issue. The strict one-design 'IOD95' had been adopted in 1994 and we had found a South African builder to make the 170 boats we needed. Unfortunately, the finances of that deal did not work out for the builder: he would have to sell the vast majority of the boats outside the country after the regatta and he simply did not have the market to do so. Whilst there are several big Optimist builders now in 2010, that was different in 1995/6 when the IOD-95 was still a new concept: There were 3 or 4 small builders and 2 big ones. In the end (and I mean the end: it was now February 1996), Winner Optimist from Denmark came to the rescue and offered us a workable deal. We had to pay for the shipping, but we found a shipping company to sponsor this. RSA Optimist team of Greg Reuvers, Simon Baer, John Eloff, Paul Wilcox and [unknown] with Greg Baker as the coach went to Carrickfergus in Ireland. The team had put in a lot of training prior to their departure and was a very cohesive and experienced team. The weather conditions were very variable but the team worked it out to produce some excellent results with Greg being the leading sailor finishing in 23rd overall. In the team racing RSA were seeded 8th. Team RSA Portugal 1998. From left to right: Ian McClarty, John Eloff, Edward van Reenen, Greg Reuvers, Simon Baer. At the back: Greg Barker (Coach), David Booth (Team Leader). From left to right: Mary Waller, Richard Weddel, Chris Deane, Roscoe Friend, Kyle Klaas. Behind: Coach Davy James and Team Manager David Booth. 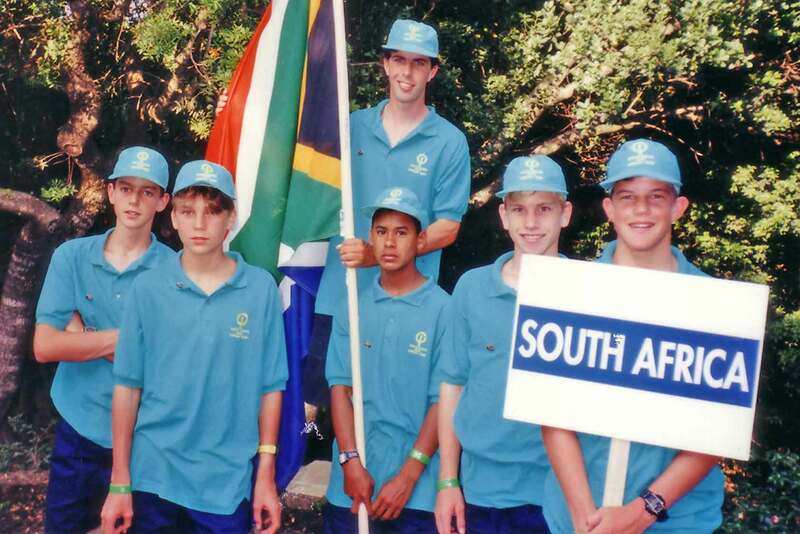 Team RSA Spain 2000. From left to right: Finn Fitzsimons, Justin Clark, Jamie Barker, Jo-Anne Parris, Greg Thijsse. 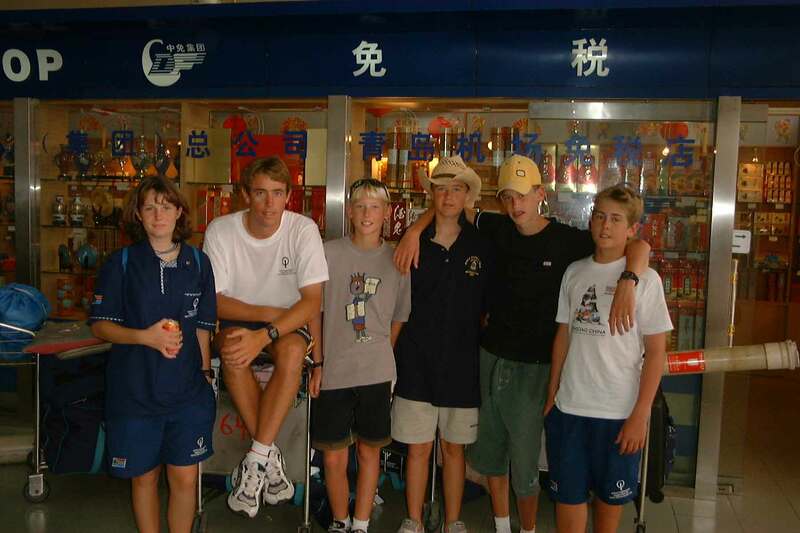 Team RSA China 2001. From left to right: Bronwyn Klaas, Alex Runciman (Coach), Justin Onvlee, Greg Thijsse, Mathew McCrystal, Finn Fitzsimons. USA. No record available yet. Las Palmas, Spain. Team leader Rob Walker (Claire’s dad!) with Alexander McClarty and Rudy McNeil. Worlds - Las Palmas, Spain. In pictures . . .
Ecuador. Coach Pete Shaw, manager Glynis Baer. Switzerland. No record available yet. Italy. No record available yet. 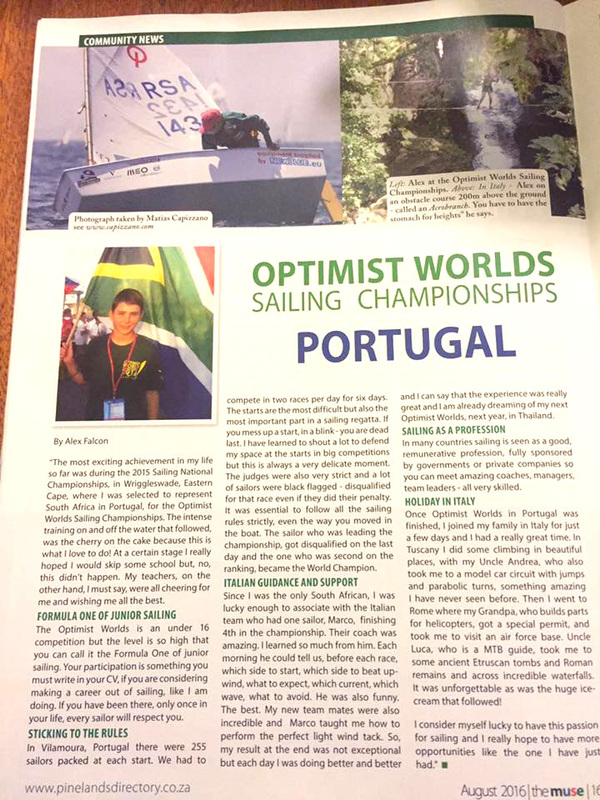 The Optimist Worlds team from South Africa was a rather multinational combination of young sailors in 2008. Alex and Ed Lehtinen flew from Cape Town to Helsinki, where they spent three weeks sailing and visiting family and friends on the Finnish South Coast. 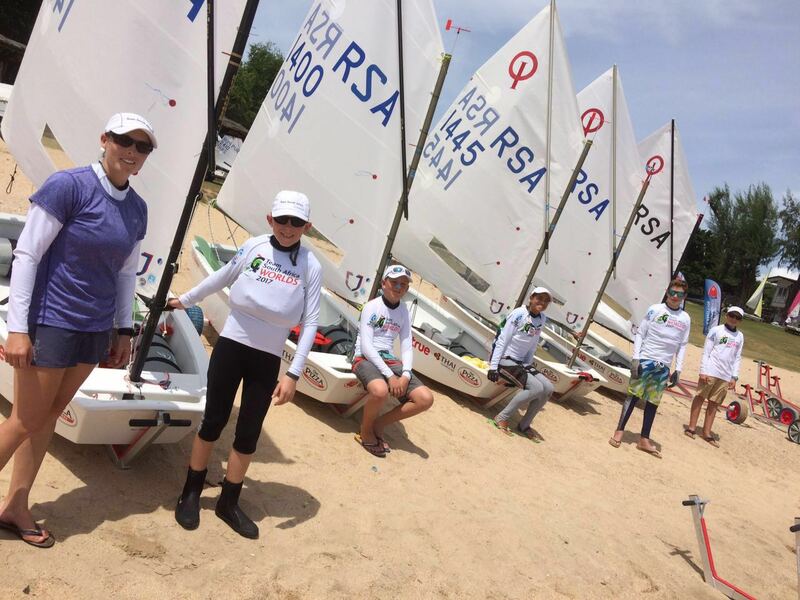 On 14 July they flew with the Finnish Optimist team to Cesme to join the rest of the South Africans for a tough week of racing in the IODA Optimist Worlds. This has been one of South Africa’s better campaigns, with Michael Crossland 41st and Alex Lehtinen 97th in the final results. Brazil, manager Glynis Baer, coach Rudy McNeil. The Worlds was held in Langkawi, Malaysia, in 2009. Glynis Baer was manager and Rudy McNeil the coach. With the championship starting on 28 December, the team of Dylan Long, Ruben Heard, Marcello Marcia, Peter Bendon and David Wilson decided to travel early and spend Christmas on the beach in Langkawi, giving the sailors some time to acclimatise to the local conditions. Light shifting winds coming off the lsland and some current in the bay made for interesting sailing. Team RSA, Worlds 2011. From left to right: David Wilson, Daniel Spratley, Travis Barrett, Dre Giovannini (Coach), Ryan Barnardo, Emil Feuillette. 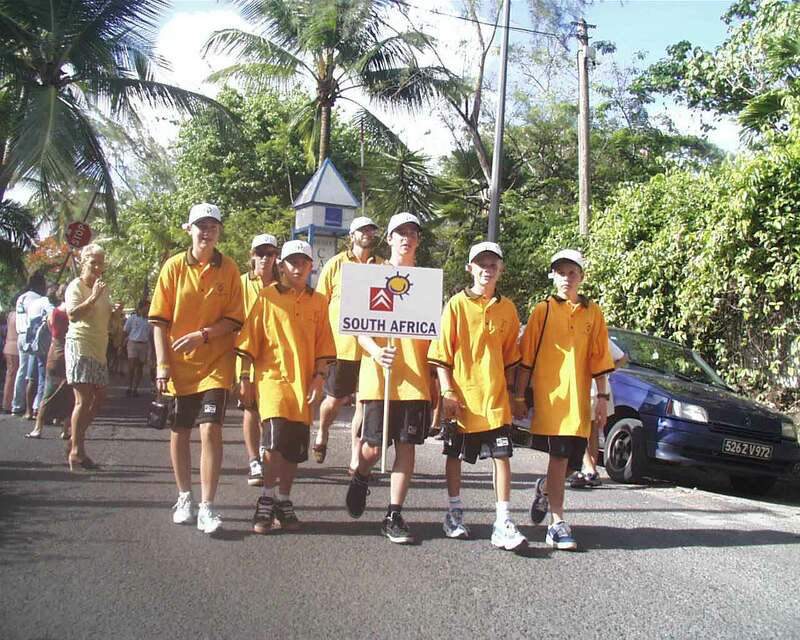 The 2011 Worlds was held in Napier, New Zealand, and was the South African team was made up by Cape Town boys David Wilson, Travis Barret and Emil Feuillette (all aged 14) as well as Ryan Barnardo and Daniel Spratley (both aged 15). They were accompanied by coach Andrea Giovannini and manager Kevin Bingham. No fewer than 210 sailors from 48 countries took part in the very technical and competitive 10-day event. The wind conditions in Napier provided some challenges, with a few races being cancelled and Team South Africa faced a bit of difficulty with the wind conditions, which were considerably different from what they are used to in Cape Town. Coach Andrea Giovannini said that there were lots of learning curves for the boys in this short space of time and the main focus was to guide the kids around these learning curves so that we could get some credible results. David Wilson, who sailed consistently, finished 47th overall. Team South Africa also finished just shy of the quarter-finals in the team-racing event. This was possibly South Africa’s most successful Optimist campaign in 10 years. This was the 50th IODA Worlds and was held in Boca Chica, Dominican Republic, with beautiful Club Náutico Santo Domingo as the venue. 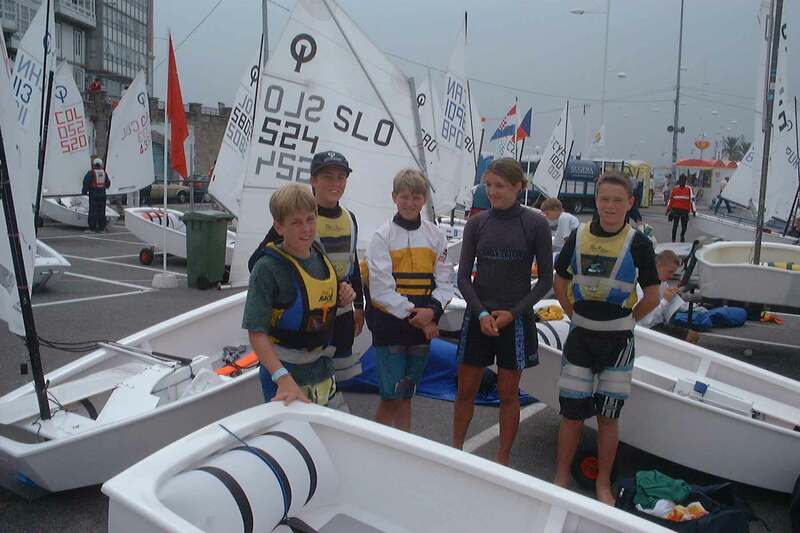 The team comprised Georgou Divaris, Henry Daniels, David Wilson and the Long brothers – Dylan and Arin, aged 11, one of the youngest sailors in the event. The coach was David Leigh and team manager was Ewen Wilson, who had a chance to dust off his Spanish while there. After nine races in tricky, shifty winds and some tropical thunderstorms in between, the best-placed South African was David Wilson who finished 61st in the 230-strong fleet, making him probably the only South African sailor who has managed to finish twice in the top 100 at Worlds. Team RSA, Worlds 2013. From left to right: Calvin Gibbs, Luuk Beekman, Georgou Divaris, Kai Leslie and Brandon Ferreira. Worlds. The 2013 Optimist World Championships was held at the classic European racing venue of Lake Garda, known for it’s strong Ora breeze and right-sided beats. A changing of the guard in Optimist sailing in South Africa saw a young and inexperienced team head off to tackle the best that the world has to offer. Calvin Gibbs, Luuk Beekman, Georgou Divaris, Kai Leslie and Brandon Ferreira faced a steep learning curve; Garda is a brutal place to learn the basics of big fleet tactics, with everyone trying to execute the same gameplan starting is critical. The team gained a huge amount and improved their big fleet skills over the week, but at the same time learnt just how much intensity and commitment it takes to place in the top half of an Optimist Worlds fleet. Next it was off to the African Championships to apply all those hard-won skills. 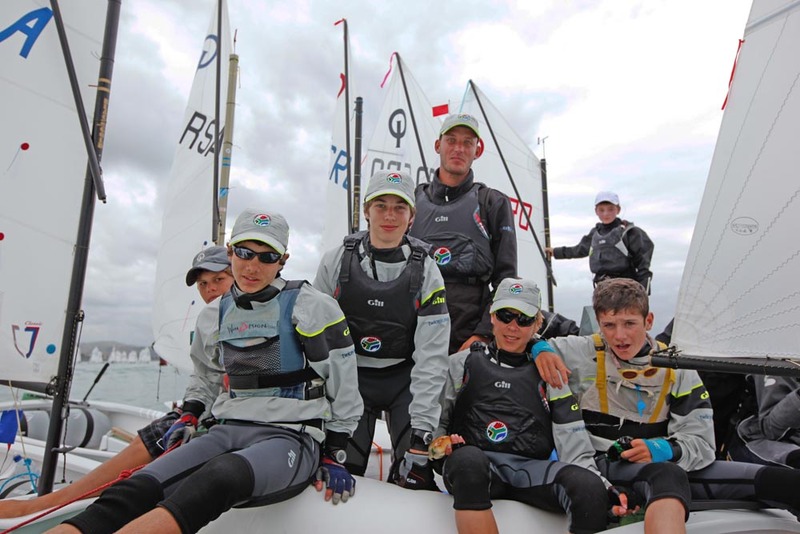 Team RSA were selected from the top sailors at Youth Nationals 2015 which was held at Wriggleswade in December 2015. The team comprises of Matt Ashwell, Chiara Fruet, Tristan Tomlinson, Keagan Nel, Duncan Hawksworth, Helen Jansen van Vuuren and Alex Wiederhold. The Team Manager Shellee Nel and the Coach was Claire Walker, both seasoned veterans in these positions having accompanied previous teams overseas. The team arrived with two practice days in hand. The accommodation was in dormitory styled rooms with a shuttle running to the Yacht Club daily. Clube Naval Du Luanda is a stunning piece of history, founded in 1883 in Luanda Bay, Angola. The club is quite uniquely situated on the peninsula facing the harbour, however a short walk in the opposite direction takes you across the road and into the sea. Launching was off the beach as there is very little wave action. 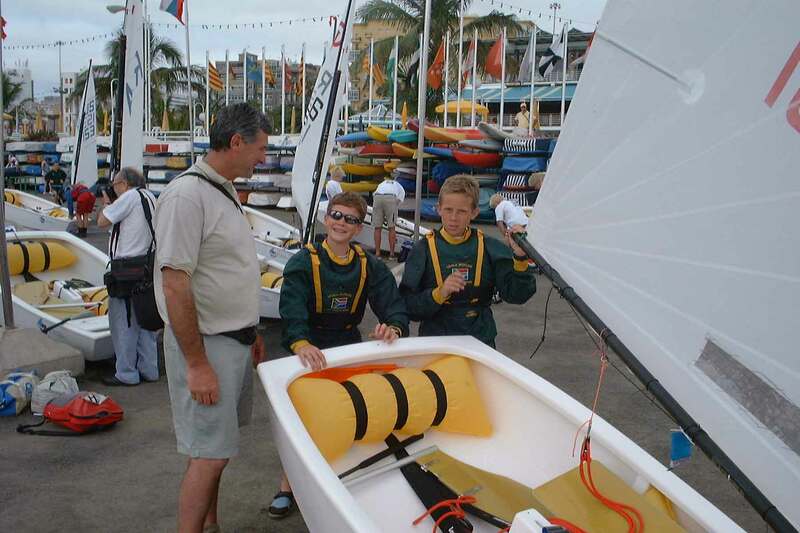 The focus on the first was to get through measurement as quickly as possible and get the boats set up and rigged. This was relatively painless as the organising committee had measured the boats prior to our arrival. Once the sails were done, we were free to finish the set up and get on the water. On both days, the race committee was on the water practicing the race course layout. This gave us a great opportunity to train in the racing area, start to identify the wind patterns and get a feel for the conditions. The coaches and race committee sped about 7nm to the race course every day, while the sailors (with help from the police and volunteers) pulled their boats across the road and onto the beach. Making it a relatively short sail for them to the race course. It was quite comical to see the Policeman stopping the traffic for a line of optimist crossing the road. The teams all dressed in the national colour and flying their flags did a short march and then Nuno Gomez, the organiser of the Angolan Africans and also Vice-President Africa, Asia and Oceania, opened the ceremony with a speech followed by some traditional colourful Angolan dancing. 47 boats were entered, meaning we only had one fleet for the duration of the regatta. Egypt had pulled out at the last minute but no reason was given. On race day 1 three races were scheduled, with the first start at 12pm. This was slightly delayed as we waited for the wind to settle. The expected Luanda conditions came through at 12:30pm, with 9-14knots of breeze starting at 250° with a left shift every 8-10minutes. At the start, many sailors struggled to get the favoured pin side due to some sailing behind the fleet on port tack for too long and eventually finding themselves in the second row with not enough time. Some of the sailors struggled to accelerate off the line and were quickly buried, making it very difficult to get clear air in the light wind and they were forced to the right in search of the space. After the first race the nerves had started to settle, however some basic mistakes were still being made. Such as tacking too often or sitting in dirty air. Race 2 began in 13knots with the wind moving 5° to the left. Keagan, Matt and Tristan had much better starts as they were able to get across the line without having to tack off immediately. Matt did very well after rounding the top mark in 4th to catch up on the run, rounding the gate in 2nd and finally crossing the line in first. Was also great to see Chiara in the top 10, she did well to catch up in the final beat. Race 3 started with the wind at 240° and the top mark at 250°. Once again the left side proved to be the favoured end, with the Angolans showing the benefit of local knowledge. Two of the South Africans came off the line with good starts, while the others all got buried. With no delay in the time to leave the shore, the racing began just after 12pm. Race 4 started in 9-10knots, with the committee end of the line being favoured but the left side of the course with the biggest gain. The wind persistently swung to the left, resulting in the left being strongly favoured, this proved to be the trend for the rest of the regatta. The fleet seemed to be pushing the line more than previously, partly encouraged by some current. The start was the first general recall of the regatta, with the next being black flag. Although Helen was black flagged at the start, she did very well up the first beat and it showed how important it was to be in the first row at the start. For race 5 the wind had picked up slightly, and shifted more to the left. The race committee called the second general for the regatta, so the fleet restarted on black flag. Unfortunately, Keagan was black flagged in this case as he tried to get back behind the line with 40seconds before the gun. Chiara had the best start of the day, and had clean air all the way up the beat. The final race of the day proved the most difficult and frustrating. The race started in 7knots and continued to die as the leading sailor rounded the gate mark and by the time 15 or so boats had finished, the wind had dropped to around 4knots. One of our sailors had a particularly difficult time crossing the line, finally managing to do so after no less than 16 tacks. The DNF score for the others were as a result of not finishing within the 20 minute time limit. However, as more than five races had been completed, the only discard had kicked in. Only 9 teams were entered into the team racing event, as a result the standard IODA knock-out flight was scheduled. With the racing taking place very close to shore and very light wind, it quickly became clear that the teams getting an early lead stayed well away from the shoreline side of the course as this was affected by the buildings. RSA raced their first race against ALG1, where they got stuck at the left on the start and couldn’t recover. The second race was sailed against SEY, with RSA winning with a 1, 3, 5, 6 meaning we were still in the competition. However, RSA was next up against ANG2 who proved too strong and we lost in 1, 4, 7, 8. The race committee held one more race for the teams which had been knocked out early, so the final race was against TAN, which RSA won comfortably (1, 2, 3, 7). Due to the fact that all races up to this point had been sailed, we were permitted a lay day. The organising committee bundled us into busses for a 2hour drive along the coast. We finally arrived at a beautiful beach resort, with a clean beach, clear water and much to the sailors’ excitement a swimming pool. The day was spent relaxing in the sun, building sand castles, swimming in the pool and eating a delicious lunch. We left the resort at 15:30 and headed back to the yacht club for dinner. Arriving close to three hours later, a very long day for everyone. Once again the race committee aimed to complete three races. After rigging and checking boats, some of the sailors seemed to still be half asleep. So we played a warm up game in the boat park to get the bodies and brains working, we also had a lot of time to kill as we waited for the wind to pick up and settle. We were finally able to leave the boat park a little after 12:30pm. The South Africans did well to be the first team to the race course, giving us plenty of time to do our speed tests, split tacks and line checks. Race 7 started in 10-11knots with the top mark at 320° and the wind at 310°, once again showing that the left was favoured. The first start of the day was once again a general recall, so the race committee reset and started very soon after on a black flag. Alex was doing better to get up to the line, however he got too close with 15seconds to go and was called over, thus the BFD. This was disappointing as it was his best race of the regatta. Race 8 started in 12knots with the wind at 290°. There was a clear pin bias and left side gain, however many boats struggled to cross the line on starboard when at the pin causing a lot of chaos and many rule 10 infringements. Chiara, Matt and Tristan had very good starts in the middle of the line and were able to get to the left quickly. Race 9 was sailed in 14knots, so far the most we had seen in the racing. The wind had moved a further 30° to the left and the chop had picked up. Matt worked very hard up the second beat to maintain his lead and successfully fended off the rest of the fleet to pick up his second win of the regatta. With nine races completed, this left only once race was to be sailed on the final day of racing. The race was sailed in 9-10knots, with the left once again being favoured. Chiara, Helen and Tristan had great starts and all three rounded the top mark in the top 15. It was nice to see some more RSA sail numbers in the top. It was a stressful race for Matt, who was covered by a few boats up the first beat and kept having to tack to the right for clear air. Overall, the sailing was competitive and the competition tough. The Angolans have clearly been training hard as they have rapidly improved. 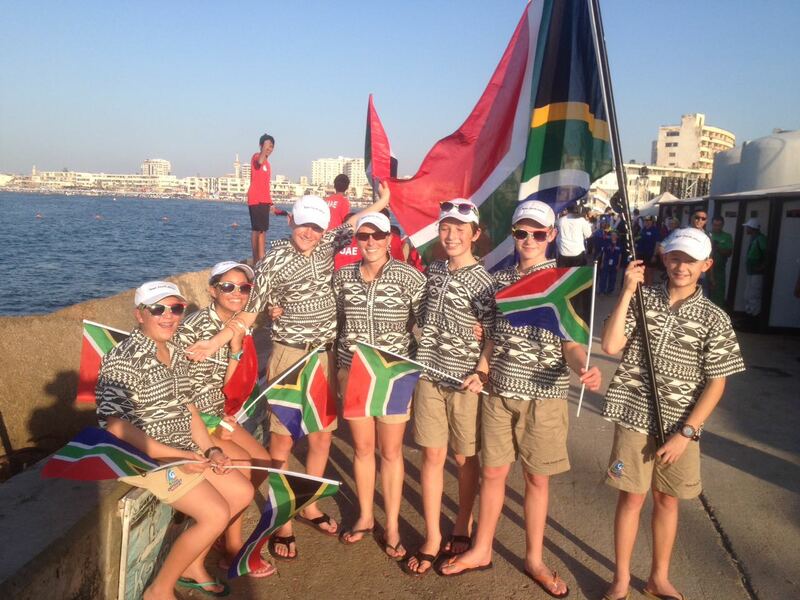 The South African teams need to spend more time competing in larger regattas. Matt and Chiara both went overseas to compete in international regattas and this was evident in their results.